The sky is often thick in Los Angeles. The sea, mountains, noise, and light create an ever-present glow that fills the lower atmosphere. Because of the city’s vast footprint, long sweeping views of urban and suburban development can be found from the islands of parkland that dot the seemingly endless sprawl. From Griffith Park, the downtown vistas of the city of angels take on similar characteristics to mountain views. Skyscrapers give the impression of jagged peaks as rows of houses disappear on the horizon. 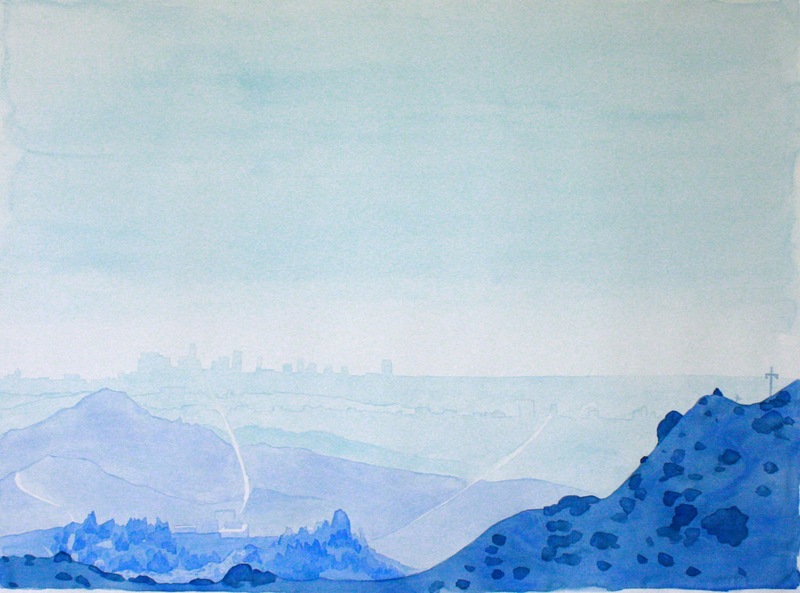 Los Angeles in Blues is a large watercolor painting, 58 x 44. Light blue washes give the impression of the city’s ethereal atmosphere, capturing the spiritual essence that is Los Angeles. The painting is framed in light gray and retails at $6,500.00. < Life among giants is always looking up.